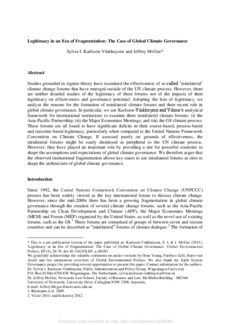 Studies grounded in regime theory have examined the effectiveness of "minilateral" climate change forums that have emerged outside of the UN climate process. However, there are no detailed studies of the legitimacy of these forums or of the impacts of their legitimacy on effectiveness and governance potential. Adopting the lens of legitimacy, we analyze the reasons for the formation of minilateral climate change forums and their recent role in global climate governance. 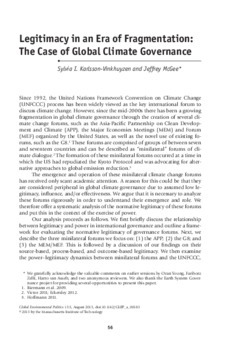 We use Karlsson-Vinkhuyzen and Vihma's analytical framework for international institutions to examine three minilateral climate forums: the Asia-Pacific Partnership, the Major Economies Meetings, and the G8 climate process. These forums have significant deficits in their source-based, process-based, and outcome-based legitimacy, particularly when compared to the United Nations Framework Convention on Climate Change. If assessed purely on grounds of effectiveness, the minilateral forums might be easily dismissed as peripheral to the UN climate process. However, they play important roles by providing sites for powerful countries to shape the assumptions and expectations of global climate governance. Thus, the observed institutional fragmentation allows key states to use minilateral forums to shape the architecture of global climate governance. © 2013 by the Massachusetts Institute of Technology.